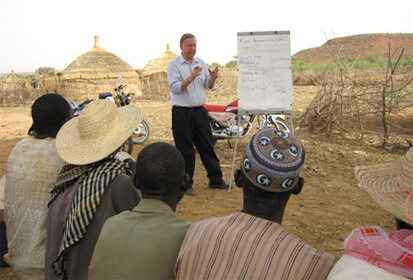 NCBA CLUSA’s USAID-sponsored Farmer-to-Farmer program sends American farmers and agribusiness professionals on 2-3 week agricultural development assignments, promoting sustainable economic growth and agricultural development worldwide. 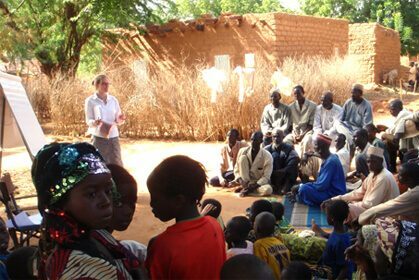 Volunteer technical assistance from US farmers, agribusinesses, cooperatives, and universities helps smallholder farmers in developing countries improve productivity, access new markets, and conserve environmental and natural resources. NCBA CLUSA’s Farmer-to-Farmer volunteers work with farmers, producer groups, rural businesses, and service providers to develop local capacity necessary to enhance food security, increase incomes and economic growth, and address environmental and natural resource management challenges. As people who earn their livelihoods from agriculture, Farmer-to-Farmer volunteers are skilled at providing recommendations that farmers can carry out using the resources that they have available. The knowledge that Farmer-to-Farmer volunteers provide never runs out, never breaks down, is never misspent and is infinitely transferrable to others. Farmer-to-Farmer volunteers carry out a wide variety of projects. Some volunteers work with smallholder farmers to improve production techniques or help better market their crops. Others might work with an agricultural processor to solve a production bottleneck or to increase their level of food safety. Farmer-to-Farmer volunteers also work in the areas of cooperative development, business planning and agricultural lending, as well as many others. As the nation’s leading organization for cooperative businesses, NCBA CLUSA concentrates its technical assistance efforts on cooperatives. Since 2010, NCBA CLUSA has deployed hundreds of volunteers, offering more than three years worth of volunteer days and impacting thousands of smallholder farmers. Farmer-to-Farmer volunteers have catalyzed over half a million dollars increase in crop sales for the host organizations they have served. Volunteers have also introduced new value added products like dried tomatoes and new technologies like an effective biopesticide made from neem seed, soap and water. We are always looking for experts in agricultural production, post-harvest handling, marketing, cooperative development, financial management, food processing and other agricultural disciplines. NCBA CLUSA pays all assignment-related expenses. If you are interested in learning more about the Farmer-to-Farmer Program, please contact us at volunteer@ncbaclusa.coop.